The Maumee Valley Herb Society (MVHS) was founded in 1972. The Society considers itself an educational organization rather than a social one. The purpose of MVHS is to bring together people interested in herbs, to further the knowledge and use among members, and to make that knowledge and its application available beyond the Society. The Society’s major contribution to the community is the financial support and maintenance of the Herb Garden located at Toledo Botanical Garden. You will find MVHS members working in the Herb Garden each Tuesday, April through October, beginning at 9:30 am. Come and visit us! 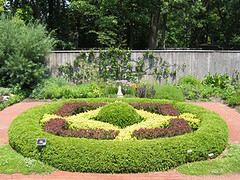 Knot Garden uploaded by herbgardener12. Knot Garden at the MVHS herb garden at the Toledo Botanical Garden.